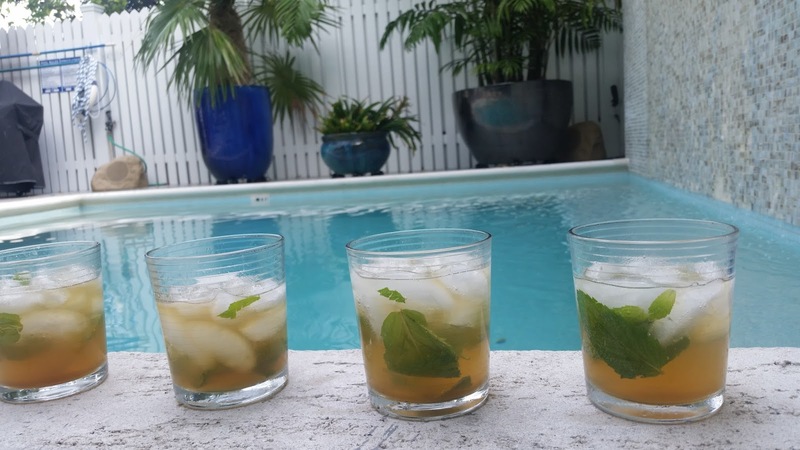 Dark Rum Mojitos: Best When Served By Our Cabana "Boy"
Early in September, five of the 8 Broads attended an informative and fun Select Registry Innkeeping Conference in Key West. Were we surprised that September is the hottest month in Key West! Staying for a few days after the conference, we enjoyed lazing the small pool of our friends’ beautiful home. Following extremely busy summer months, we innkeepers needed a break! So one entire day was spent lounging in the pool. Kristie’s husband, Ray, happily volunteered to be our “cabana boy”, bringing freshly made mojitos and lunch to us. It was a wonderul day! We supremely enjoyed not only each other’s company, but being treated to such fine service. A special shout-out and gratitude to Dean and Paul for the use of their home. For these mojitos, we used a fine Cuban dark rum. Amazing. Note: these taste best while relaxing in a pool and served to you with joy. Muddle the mint leaves, lime juice, and brown sugar together, then pour into glass. Add the dark rum, crushed ice and finally soda water to top off the glass. Stir and serve. Makes one yummy and smooth mojito.